Prior to their ROSfest performance in 2012, Sanguine Hum had recently signed to the Esoteric Antenna label, (a division of Esoteric Recordings/Cherry Red Records), for the release of the Diving Bell (12) album and it therefore seems appropriate that the label have made the concert available on CD with the added bonus of the visual. 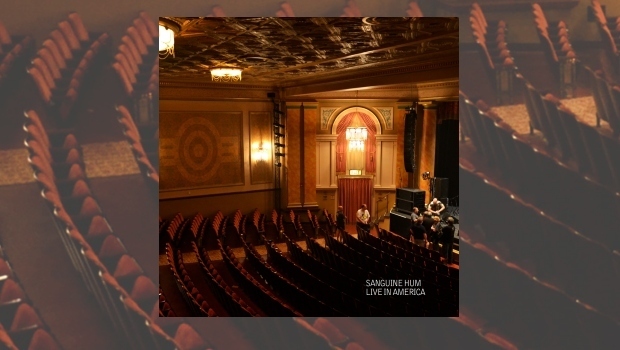 Although the audio has been previously available as a download, this excellently packaged CD/DVD release of Sanguine Hum’s performance on the Sunday morning of 6th May 2012 from the Majestic Theater in Gettysburg is certainly worth the investment. Starting out as the oddly named Antique Seeking Nuns, I had the good fortune to stumble across the band for the last of three EPs released under that name, and the engaging Careful! It’s Tepid (09). Sadly I no longer have that EP, nor the previous one, Double Egg With Chips And Beans, but certainly remember both were enjoyable and certainly Careful! It’s Tepid had some cracking tracks on it. 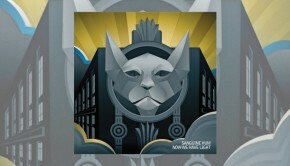 Alongside Antique Seeking Nuns the guys released several singles and a more song based album, Songs For Days (07), under the name Joff Winks Band. Finally there was a side project, Nunbient, who I have no knowledge of, before Sanguine Hum emerged circa 2009. 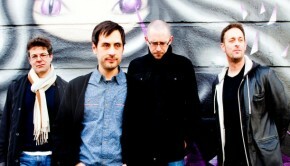 Throughout all these incarnations have been composers Joff Winks (vocals & guitar) and Matt Baber (keyboards), closely followed by the rhythm section of Brad Waissman (bass) and Paul Mallyon (drums). Although prior to the trip to America Mallyon made the decision to leave the band and was replaced at relatively short notice by Andrew Booker (no man | Henry Fool). It has been this steady line-up that has allowed these musicians to hone the rather unique sound that carries across all of the “projects” and is reflected in this concert, where the older material seems as fresh as the new tracks taken from their recent, at the time, Diving Bell album. The seated theatre environment of the venue seems an ideal setting for Sanguine Hum, befitting their rather laid back, atmospheric approach, encompassing a healthy Canterbury infusion, which is subtlety complex, but not afraid to crank it up where necessary and let rip from time to time. As might be expected a large portion of the set is devoted to material from Diving Bell kicking off with the riffy The Trial. The band are really tight and cooking from the off – and that tightness comes from the punchy rhythm section, Joff Winks aggressive guitar which sits on varied bed of more mellow keyboard sounds. After some warm applause the band drift into Cat Factory, with a great groove from the drums, laying foundation for fantastic bass line that just makes your head and feet want to move. Again Matt Baber’s keys are warm and subtle whilst Winks adds the controlled power. Not sure how much the band gig, but the DVD catches little in the way of interaction between band and audience, which is a bit of a shame, although worth bearing in mind that this was pre-lunch on the final day of ROSfest and the Sanguine’s music is more a sit and listen experience – certainly wouldn’t want to try and dance to it. This said the audience are appreciative and the band deliver their music with aplomb. Testament to the material and writing is how comfortably the songs sit together and perhaps best illustrated by the neat instrumental, Earth Song [With One Sugar] to give it its’ full title. Taken from Antique Seeking Nuns’ first album Mild Profundities (03), here Matt Baber adds in some electronic sequencing in a track that brings him more to the forefront. At times you forget that this is a live album as he leaps from Rhodes piano and strings along with a few lead synth lines. Joff Winks also turns in a fine melodic solo, that more than confirms his technique. A shame there’s nothing from Careful! It’s Tepid, however we are more than compensated as we return to Double Egg With Chips… for the following two tracks, Double Egg and Son Of Bassoon, the latter a delightful solo piece performed by Matt Baber. The concert concludes with two tracks from the Diving Bell release, both encapsulating much of what Sanguine Hum are about. The title track ranges from delicate electric piano and arpeggiated guitar chords, languishing in masses of open space,through lush strings and wispish synth runs, the ‘sevens feel’ instrumental links and here Josh Winks turns in possibly his finest vocal of the gig. Close-out track is the instrumental Coast Of Nebraska which has some of the groove found in Cat Factory, along with the grittier parts of The Trial the mellowness of Derision. In general I like to listen to music and am not overly keen on live DVDs and the up side with Sanguine Hum’s music is that it works within its own right. The DVD is however and enjoyable watch, although there’s little in the way of visual effects, with the lighting being more mood setting and as a consequence a little dark at times, causing the images do become a little pixelated on a larger screen. But as you will be able to see from the two Youtube clips included here, the performance is well worth watching. The bonus material, additional to the CD, is footage of the travel to and from America, a bedroom rehearsal and an audio interview. This CD/DVD package was released at the end of June and as a limited edition run, so if you are thinking of grabbing a copy – don’t wait too long! Although the Antique Seeking Nuns and Josh Winks Band releases are still available as downloads via Bandcamp, it might be a nice idea if they were compiled into one release? DVD: The track listing for the DVD is the same as the CD with added footage of the band’s journeys to and from Gettysburg, bed room rehearsal and audio interview.